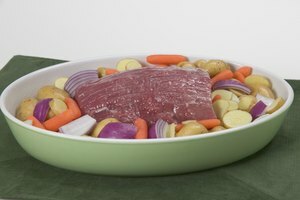 Corned beef is a cut of beef called a brisket that has been preserved with salt. There is no actual corn in it; the term "corned" comes from the chunks of rock salt used to cure the brisket, sometimes referred to as corns of salt. 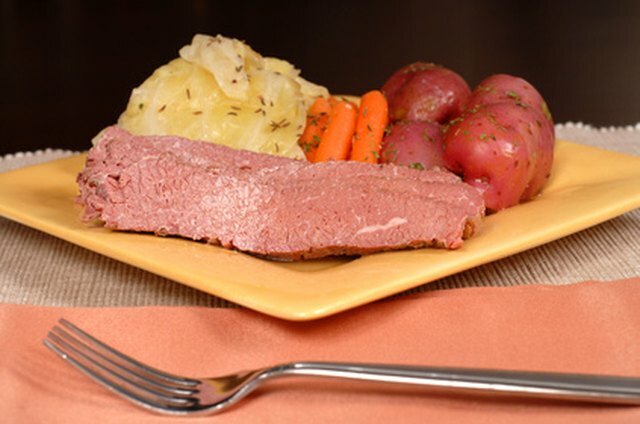 Corned beef is often served with cabbage and potatoes and is a popular St. Patrick's Day dish in the US. 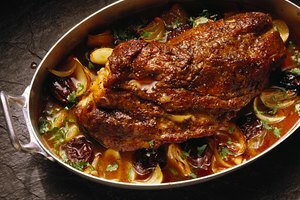 The meat should be sliced fairly thin and served warm. Place the corned beef on a serving platter, fat side down. 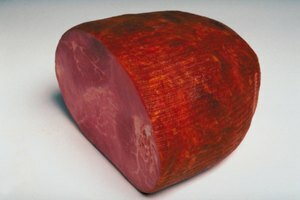 Locate the grain of the meat: the grain looks like shallow grooves running the length of the meat, like the grain of wood. Pierce the corned beef firmly with the meat fork. Use the carving knife to slice the corned beef into thin slices. Slice the meat across the grain: place the knife so that the blade forms a right angle to the grain of the meat. Start at the leaner end and work toward the fattier end.